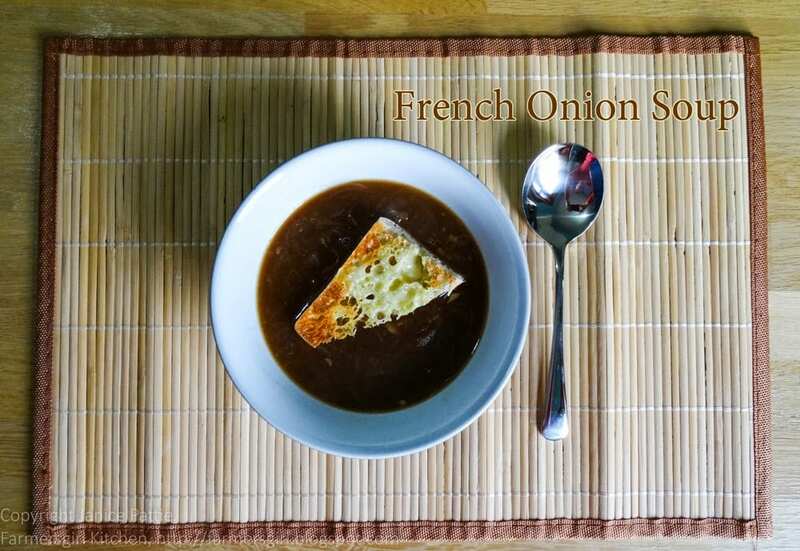 It’s been quite a long time since I’ve made EasyFrench Onion Soup and after eating it today, I realised that I must make it more often! I was looking for a simple soup to make and knew I had plenty of onions in the vegetable drawer of the fridge. I used my OXO Good Grips mandoline to slice the onions finely and gently sauteed them with oil and butter until they were soft and golden. It was only then that I thought I should, perhaps, check out a recipe. I found the ideal recipe at BBC Good Food although I didn’t use wine in my soup but replaced this with a bit more beef stock. I had one pannini roll left over from the Chorizo Burgers so split it, divided it into triangles, drizzled with olive oil and some cheese slices and put it under the grill to brown. 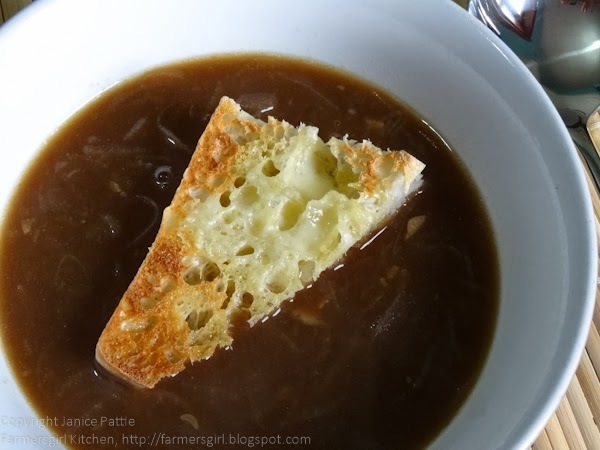 The bread was perfect to float on top of the soup and then push down into it, soaking up all the sweet oniony broth. This is such a simple soup to make and the ingredients are inexpensive and freely available, so I am entering it for this month’s Credit Crunch Munch, the blog event run by Helen at Fuss Free Flavours and Camilla at Fab Food 4 All. Your blog looks amazing Janice!!!! Soup looks good too, but veggie stock for me. Thanks for your advice, Jac. It was easier than I thought! Love your new header, Janice! And a perfect soup for January. That's a brave step you've taken, but really like your blog redesign Janice – great header. And I'm invariably happy with a good bowl of soup. Love the blog and love that soup!